It was a sad walk back over to the intersection as my son and I, with a shovel and a wheelbarrow, dealt with the death on the curb. We’ve had our cat since we discovered her and her sisters in the rafters of our barn six years ago. She was a sweet kitty and a comfort to have around. She was a great hunter, a tireless mother, and she lived for the moments when we would stop our busy lives to stroke her long, fluffy coat. A whirlwind of burial activities commenced that late afternoon as the kids and I dug a deep hole and lowered Lola in. 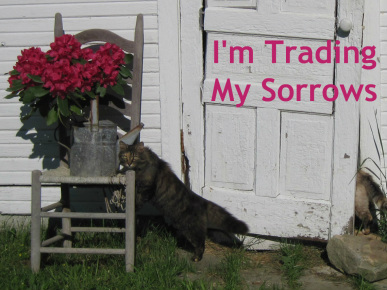 We pressed a small wooden cross on the dirt mound and sat there for a while working through our sadness by sharing happy memories of our cat’s life. Her sister, a long gray haired kitty, rubbed up against the cross and let me stroke her as she laid her head on a stone over the freshly dug earth. Do you ever wonder where pets go when they die? It’s a strange thing because, unlike human fate, the Bible is very unclear about the eternity of animals. And my mind always flits to the issue of the overcrowding that would take place if God let every animal that dies into the pearly gates. But still, I can’t see how our loving God could overlook the passing of the animals that we hold dear. I remember when our family dog Sparky died. I was in college at the time, so I had some emotional distance from the event. But my mom was devastated. During that time, I found an entry in the “Our Daily Bread” devotional that dealt with pet death, and I passed it on to her. This is a great scripture that reveals our worth to God, but when we back up and take a closer look, we see God loving the animals too. I mean, where are God’s eyes in the first part of the scripture? The sparrow! Yeah, those little brown birds that eat french fries in mall parking lots. They’re just small, simple birds and yet God’s got his eyes on them. And if he’s watching the sparrow, then maybe he’s watching our special pets too. I may be wrong, but I’m banking on the notion that the creator of the universe has his own wonderful plan when it comes to our pets. The words of that song washed over me like a spring rain, and I knew I had some trading to do. This morning when I brought our other cats’ their food, a fresh wave of sadness came over me as I counted only three. Maybe, if I call loud enough, she’ll appear, I thought with sad hope. But then something reminded me of the little lives I still had before me. There were still warm bodies to cuddle, backs to scratch, ears to smooth. Trusting that God had things with Lola all worked out, I knew I had some loving to do. “I hereby confirm my covenant with you and your descendants, and with all the animals that were on the boat with you—the birds, the livestock, and all the wild animals—every living creature on earth.